Diana Dungan held an event at Newicks in Concord, New Hampshire on September 8, 2018 to educate Marine families about the Luminary Initiative. Diana passed out Gold Star luminary bags, MarineParents.com informational folders, and MarineParents.com wristbands. Attendees honored Cpl. Jonathan Currier, the 13th MEU Marine who was reported overboard from the amphibious assault ship Essex on August 9th, with a toast as requested by his mom. Each attendee wrote and attached a message to balloons and released them for Cpl. Currier. 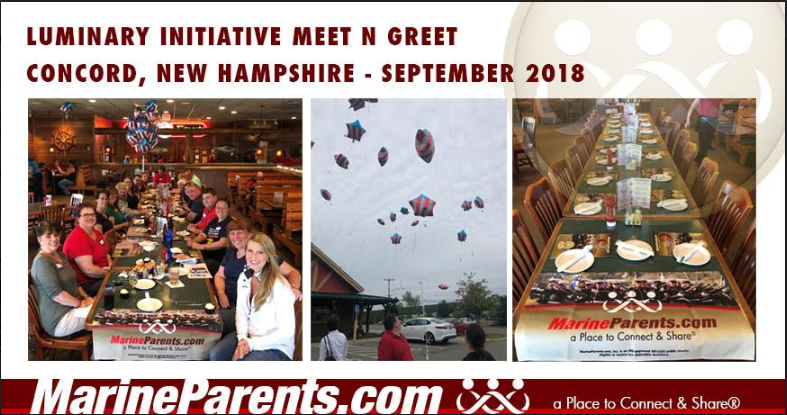 This was the first time for most attendees to meet in person; most had only previously interacted in the Official MarineParents.com New Hampshire Facebook Group. Members made plans to light their luminary bags at dusk on the last Sunday in September, Gold Star Family Day, to honor all fallen military personnel and their families. They also discussed support for Marines nearing the end of their contracts and transitioning to civilian life. Diana said, "It was a great event, some tears, lots of great conversations and embracing the big Marine family we belong to." You can learn more about the Luminary Initiative at LuminaryInitiative.com.